Piano recital dress codes can vary by musical style, venue, and level of formality, so always confirm details with the event coordinator or your music instructor. But, there is a simple universal norm to fall back on if you’re unsure what to wear to your performance. Formal pants are an appropriate choice for male or female performers. 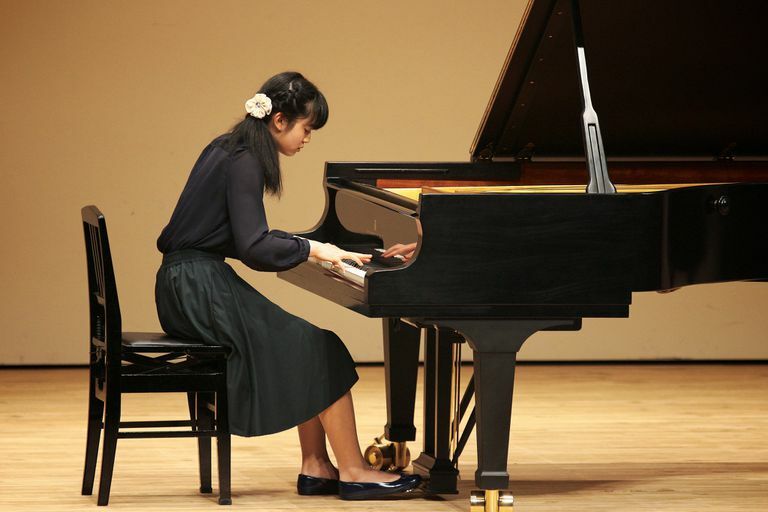 Female pianists may also choose a skirt or dress, but it should be knee-length or longer. Wear dress shoes, but avoid higher heels or any shoes with slippery bottoms, which could slip on the piano pedals. Female performers: You usually have more options when it comes to tops, but a formal blouse or button-down is a staple fall-back. No matter what, make sure your top will stay in place during an animated performance and that it isn't low-cut. Male performers: Wear a dressy but comfortable shirt. Find out ahead of time if your event requires a formal jacket or tie. Remember that when dressing for a piano recital, you’re dressing to perform. Some garments and accessories can turn into annoying distractions on stage and prevent you from playing your best. Do wear temperature-appropriate clothing. Ask about (or try to experience) on-stage conditions before a recital. For example, warm winter clothing might be uncomfortable under hot stage lights. Keep in mind that between nerves and moving around while playing, your body temperature might be elevated. Do wear pedal-appropriate shoes. In addition to high heels and slippery soles, avoid boots or any footwear that might constrict your ankles. Also, make sure your shoes fit, especially if they're new. You don't want your shoes sliding off your feet while you are trying to use the pedals. Do consider your hairstyle. Whether you’re male or female, make sure long hair won’t block your view of the keyboard, and if you pull hair back, make sure it’s not so tight that it’s painful to turn your head from side to side. You should also keep your hair back on the side facing the audience so they can see you. Don’t wear fabric or jewelry that makes noise or gets in the way when you move. Common culprits include bangle bracelets, loose-fitting watches, large rings that may turn in between your fingers during play, and anything that could reflect stage lights into your eyes or the audience's eyes. Dress for comfort. Pants and skirts should not be too tight, whether you’re standing or sitting, but neither should they be baggy. Choose materials that provide some stretch but don't easily wrinkle. Tops should allow for movement, particularly in the arms and shoulders, so you can reach all 88 keys comfortably and without struggling with your clothing. What Does Mountain Casual Attire Mean?